Many Latin American economies are booming due to strong inflows of capital and stronger export earnings from high commodity prices. Though favorable today, this situation is also a double-edged sword. Households, companies, and banks are spurred to take on financial risk. But, if risks become excessive or poorly managed, they sow the seeds of future problems. The region has experienced firsthand the boom and bust cycles that can ensue, and there is consensus that this needs to be avoided or minimized in the future. The IMF’s two latest Regional Economic Outlooks for the region—published in May and October 2010—focused on precisely this issue. While the bottom line is the need for effective macroeconomic policy management and implementation, information is an essential ingredient. Countries in Latin America have made good progress in strengthening statistics. Yet, we see three main areas that are particularly relevant for monitoring the accumulation of risks and potential overheating, that are not yet sufficiently well-developed, namely: credit conditions surveys, housing price indicators, and data on the financing structure of companies. How restrictive or lax are loan approval standards? What factors explain the changes observed in bank behavior? What is the role of the economic environment or of changes in customer portfolio risk? These types of surveys serve an important role. The information compiled complements the data captured through the analysis of interest rates, intermediation margins, and lending volumes, and can be used as a tool to determine whether demand (changes in the credit appetite of customers) or supply (decisions taken by banks) is driving changes in lending levels. In addition, such surveys are very useful for forecasting changes in the economic cycle. Despite their usefulness, these surveys have only recently come into widespread use in advanced economies. At present, very few emerging economies produce such surveys and, in Latin America, only Chile and Colombia prepare them on a regular basis (see Table). Second, action is needed to develop property price indicators. The economic crisis in several advanced countries, primarily in Europe and the United States, served as a reminder that excess demand and credit can lead to highly overvalued house prices in boom times, exposing households and banks to the risk that a price reversal could significantly affect their wealth and capital levels. The recent expansion in mortgage loans and the potential for house price increases in some countries in Latin America is therefore a factor that needs to be analyzed more closely and carefully. The absence of systematic housing price series for the majority of countries in the region hampers risk monitoring and assessment and, by extension, timely decision-making to avoid excesses related to the real estate sector. 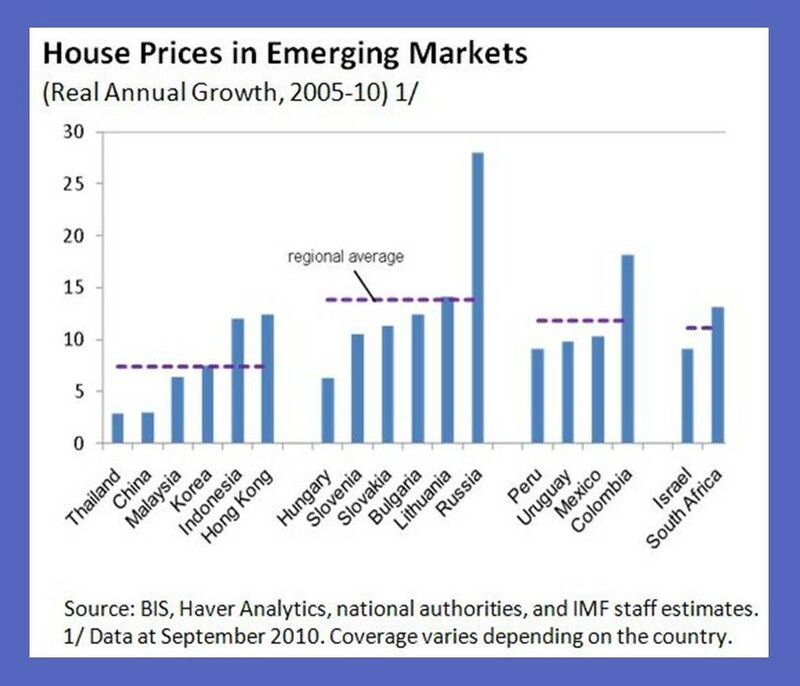 Currently, and in contrast to emerging countries in which data availability is somewhat higher, only four countries in Latin America produce data on housing prices (see chart). Further, many of the series are of short duration, with varying coverage and sometimes varying methodology used (see, for example, the European Commission’s price index manual). Still, the methodological and operational challenges to preparing comprehensive and unified housing price measurements should not be a deterrent to pushing ahead with work in this area. There is a need for more detailed information on the financing structure of the corporate sector, particularly regarding foreign currency and maturity mismatches, and exposures to complex financial instruments such as derivative contracts. Companies tend to increase their debt levels when external financial conditions are favorable—as is currently the case for many emerging markets—which, in many instances, can exacerbate mismatches on their balance sheets. For example, currency mismatches (in cases of firms with foreign-currency-denominated debt and local-currency-generated income) and maturity mismatches (in cases of firms with predominantly short-term debt). This was one of the key vulnerabilities during the Asian crisis of the late 1990s. Countries in Latin America have made welcome progress on the compiling and disseminating balance sheet data, especially for the largest companies. However, relatively little information is available on their debt structure (currency and maturity) and financial exposure, including to derivative instruments. Shortcomings of this nature were brought to light in Brazil and Mexico in 2008, when severe losses occurred from operations in the foreign exchange derivative market. Systematic compilation of such data is a difficult, but nonetheless, vital task in properly assessing risk, particularly given the complex interactions between the corporate and financial sectors. The measures adopted in Brazil and Mexico starting in 2009, for instance, could be used as a good starting point. In Brazil, all financial institutions are currently required to report their exposures to derivative contracts (see the Central Bank of Brazil’s Financial Stability Report). Similarly, in Mexico, all companies that issue securities, capital, or long-term debt are now required to document the market, credit, and liquidity risks related to financial derivative contracts and to assess their importance for the company’s financial position (see the Bank of Mexico’s Financial System Report and the amendments to the Stock Exchange Law).